So I bought a mini muffin tin a while back. I want to make these mini frittatas baked in a muffin tin I’ve keep seeing all over Pinterest. Except that...I never made them. Thing is, when I’m in the mood for frittata I usually grab a frying pan, crack a couple of eggs, add some sauteed veggies and voilà, the frittata is served. It doesn’t even cross my mind to preheat the oven, grease a muffin tin and bake the frittatas in the oven. Maybe one day I will get over them, but until then I’m going to use my mini muffin tin to make what it was manufactured for in the first place: mini muffins. 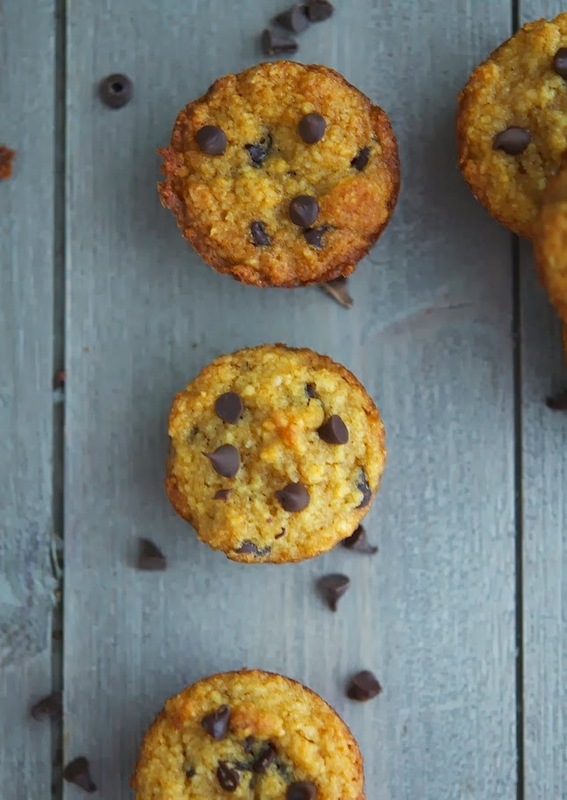 It takes only ten minutes to make these mini muffins happen in your kitchen. One bowl, one spoon, two minutes to combine all the ingredients plus 8 to 9 minutes in the oven. It doesn’t get quicker or easier than that. Voilà. Why am I telling you this? Because you can basically make them any day of the week. You don’t need a weekend to make mini muffins. Everyday is a good enough day! 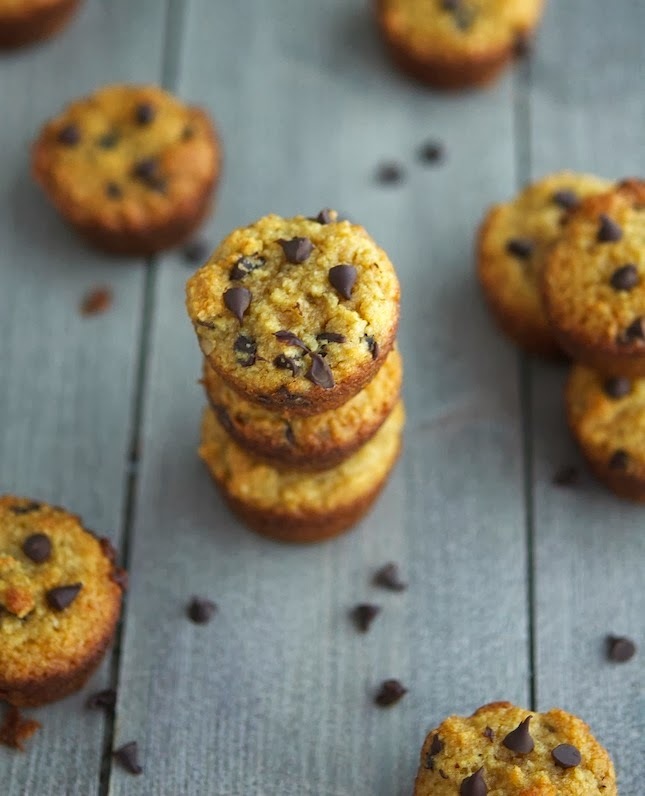 (Paleo) Choc Chip Mini Muffins Print this recipe! Preheat oven to 350°F (175°C) and place a rack in the middle. Grease generously a mini muffin tin. Set aside. In a bowl combine almond flour, baking soda and salt. Add egg, butter, honey and vanilla extract and stir until just combined (do not overmix). Fold in mini chocolate chips. 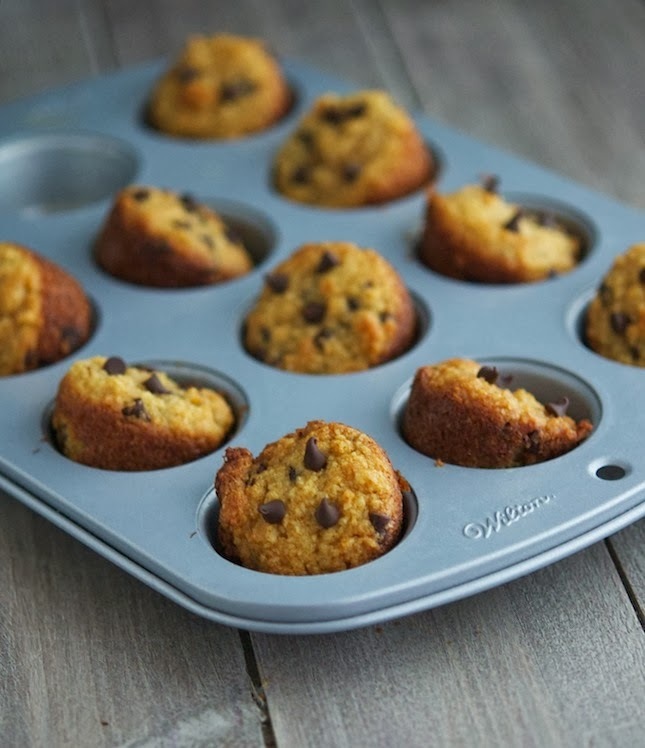 Scoop one leveled tablespoon and fill muffin tins (it should get ¾ of the way). Bake in the oven for about 8 to 9 minutes, until a toothpick comes out clean Do not over bake. 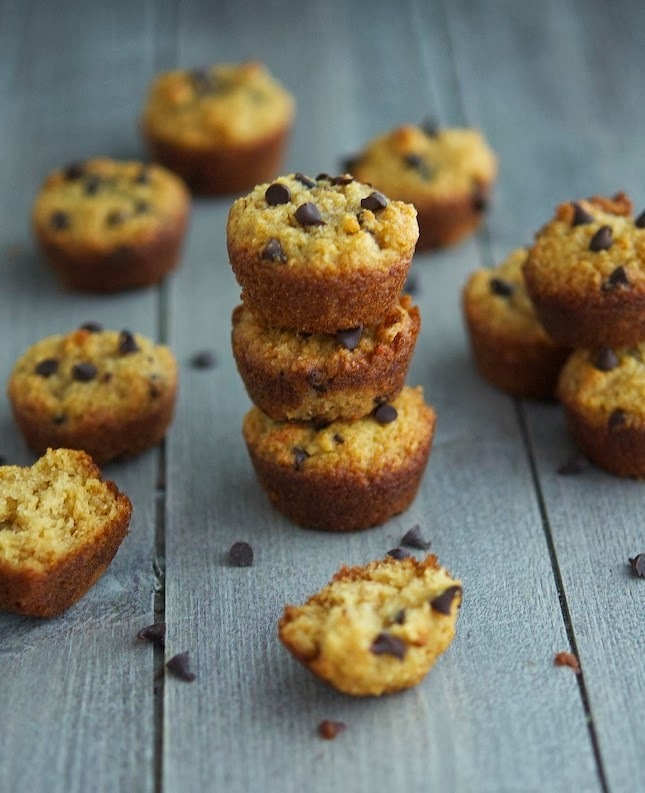 One mini muffin yields 88 calories, 7 grams of fat, 5 grams of carbs and 2 grams of protein. Oh wow - these look delectable! I have always used almond meal in addition with oat flour or whole wheat, I have never thought of using it on its own - thanks Mike! They are amazing Sash, and so quick and easy to make! Hmpft. I will have you know that scraping the bowl clean is strictly reserved for my raw batter tasting needs. So I say your recipe would probably only yield 11 mini muffins for me. And seriously, I dunno man, for some strange reason, my batter always seem to shrink during transfer from bowl to pan. It's probably the cold liquid that does it. Or cold eggs, whatever. Or maybe it's just that I let it sit for too long... Alright, alright, it's probably because I taste test a little too much, but seriously, it does shrink too, I swear! I just googled flax eggs. Never knew we had to refrigerate it to get the consistency of eggs, interesting, thanks. 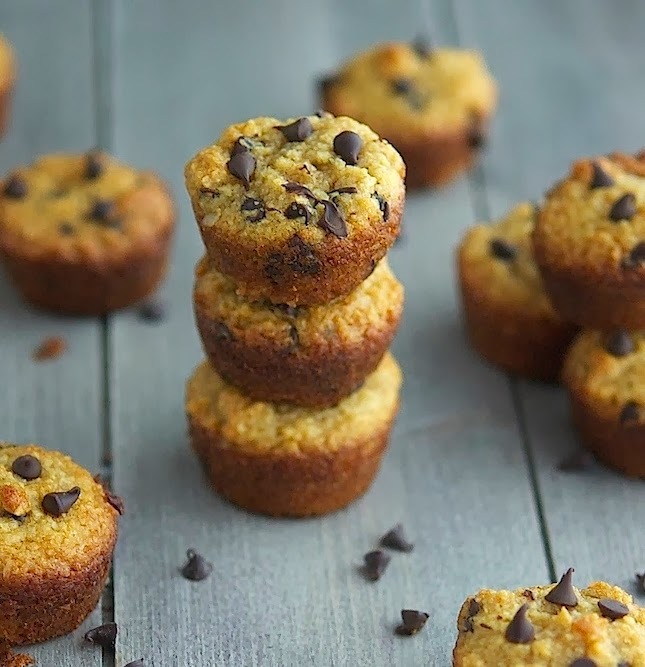 These muffins do look healthy and quite hearty too. Pinning. It's amazing how many things you can do with flax seeds, isn't it? Just made these on a whim! So yummy and so easy to make! They came out perfectly! These are so delicious! I accidentally used almond butter instead of butter/coconut oil but they turned out wonderfully. My fiance will most likely polish these off by the end of the night..Thank you for the great recipe! Look nice, but one thing I don't understand: you use http://tinyurl.com/p94bxwb and on the nutritionlabel is standing: 1/4 cup is 28 gram, so 3/4 cup would be 84 grams. In your recipe you say: ¾ cup / 4 oz / 115 gr almond meal/flour ? Can you use a combination of flax and chia seeds for the flax egg? My muffins actually sank in the middle both times. Made these for me and my girls.......we liked them! I used coconut oil instead of butter and a flax egg instead of chicken eggs. Next time i would add more honey and no chocolate chips. Using butter would make these non-paleo, so, if paleo is important for your diet, opt for the coconut oil alternative.